In the production and repair of stringed instruments such as violins, violas and cellos, hide glue, typically from horses, has traditionally been the standard. It can easily be stronger than the materials it holds together, and yet it is water soluble and will easily dissolve when wetted, making the repair process easier. Though it is increasingly seen as inhumane because it comes from horses, the instrument making and restoring industries (as well as antique restoration in general) are still several of its biggest markets. Animal skin and tendons are soaked in water, and the hide liquor is extracted, reduced and dried, then chipped into pellets, flakes or powders. Hide glue can last a long time in this form, though once it’s dissolved in water it can mold within a day. 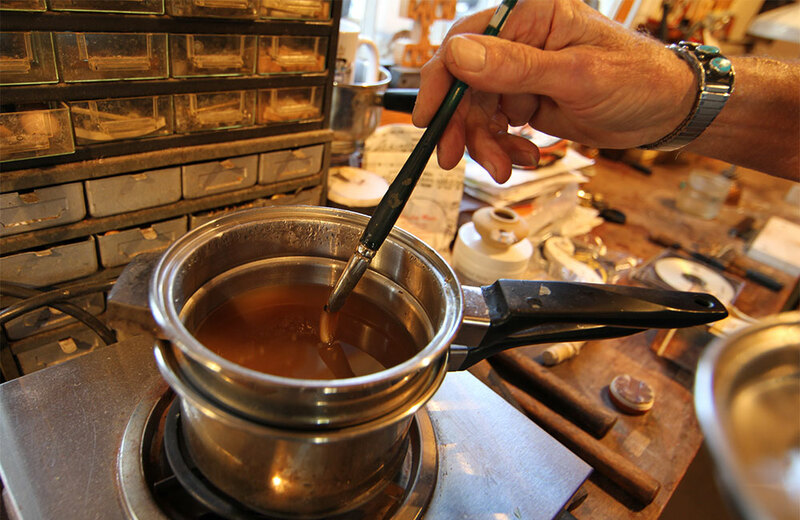 Once the flakes or pellets are dissolved, the glue needs to be heated to about 140 degrees, and then it must be applied quickly before it cools. A liquid form of hide glue at room temperature can be achieved by mixing any hide glue with urea. Rabbit glue can also be made by boiling down rabbit skin and tendon. It has the same properties as the kind from horses, but appears whiter in color. Though synthetic glues were introduced to the market half a century ago, hide glues remain the preferred adhesive in the construction of fine cellos, violas and violins. Hide glues allow an elasticity that expands and retracts along with the wood of the instrument. Synthetic glues are non-negotiable once they’ve dried, and also will not dilute in water. Synthetic glues also will destroy wood in the process of being removed. If a violin is stressed, breaking is most likely to happen at the point of hide gluing, which is easy to fix, unlike if the wood suffers damage.